MOTTO DISTRIBUTION » Blog Archive » Oscar Tuazon @ Motto Storefront (Vancouver). 26.06.2010. Oscar Tuazon @ Motto Storefront (Vancouver). 26.06.2010. Motto Storefront @ Artspeak, Vancouver. Programm update. Oscar Tuazon is a artist, writer, publisher and curator based in Paris, France, and Tacoma, Washington. In 2007 he co-founded Castillo Corrales, a collectively-run gallery in Paris, and Section 7 Books, its in-house bookstore. 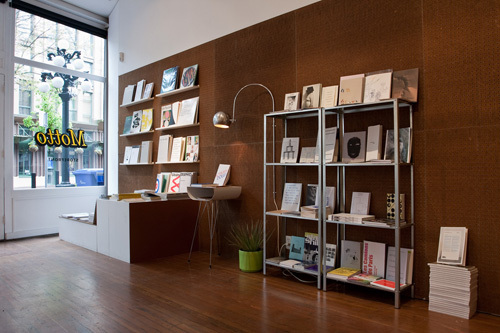 Begun as an attempt to establish a new infrastructure for small-press publishing within Paris, the store hosts regular events including, most recently, talks by Brian Kennon (2nd Cannons Publications), Will Holder, and Aaron Flint Jamison (Veneer Magazine). Tuazon’s own work has appeared in solo exhibitions at ICA London (2010), Kunsthalle Bern (2010), Künstlerhaus Stuttgart (2009), and Palais de Tokyo, Paris (2007). A catalogue of his work was recently published by Do.Pe. Press and Paraguay Press, with Kunsthalle Bern, Centre d’art Contemporian Ile de Vassiviere, and Parc Saint Leger. This entry was posted	on Tuesday, June 22nd, 2010 at 10:26 pm	and is filed under Uncategorized. You can follow any responses to this entry through the RSS 2.0 feed.